LOL musicfan! Don't worry, Clay Aiken won't be missing for long!! He's got lots of plans for 2010, and I bet he's just waiting for the right time to share them with his fans! GFI is coming up soon! He can't stay hidden away much longer …. thank heavens! lol….we should put out an APB. I like your approach to our missing person. Hopefully, the "case" will be solved … SOON! Thank you for posting LCV's video of Clay Aiken. I don't think he is home. I knocked on the door and no one answered. Thanks for using my montage musicfan! Where the heck is he????? I hope he knows how much he is missed. 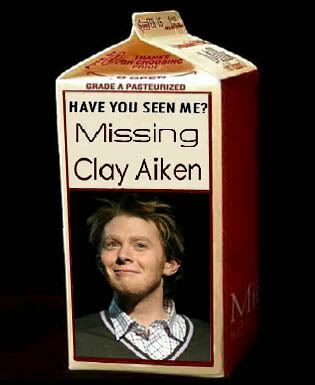 Clay Aiken is MIA and he sure is being missed. APB…..WE NEED THIS MAN FOUND RIGHT NOW……WE ARE DEFINATELY MISSING HIM. Mr. Clayton Holmes Aiken, where the heck are you and what exactly have you been up to? We want some details or at least a hint or two. I wonder if CLay even realizes how much we miss him……..This has been a LONG waiit for all of . I know that it wwill be worth the wait, but I really need to hear something!! My mood is getting worse and worse!! Clay Aiken sure has been quiet for a while. Hopefully the lull before the storm is almost over and GFI will be the beginning of and exciting time for him and for us! Love your blog, Musicfan, and great montage LCV. We are going to get his attention somehow! Ha ha ha. I love this. I hope Clay sees this website at some point. He needs to know that his fans are missing him. I've been looking high and low for him. I called him..and he doesn't answer his messages either. Lol! I think the Man has been very busy working on his new CD and getting everything in order..then he will be back with a bang. Maybe, if we're lucky, the people lucky enough to go to GFI, will find out something. Can't wait for That Man to come back to us. He has been greatly missed!! He will surprise us when we least expect it!!! I have faith…….!! Error: Error validating access token: Session has expired on Tuesday, 21-Aug-18 16:13:01 PDT. The current time is Saturday, 20-Apr-19 01:28:12 PDT.